There are many ways to test for soil nutrients. The amount and pattern of nutrient availability can be significantly different from field to field and may be affected by a number of factors, including soil type, topography and fertilizer history. Zone sampling can be a practical option when you want to go beyond composite sampling or look at managing individual fields differently. You may choose to pick your zones based on USDA soil survey maps, topographic maps or consolidated yield data. But the R7® Tool offers a quick, effective way to build zones throughout any field. With the R7® Tool, you can choose multiple satellite images that best represent the field. Within the tool are more than 20 images per field — including current and past seasons — dating back 10 to 15 years. 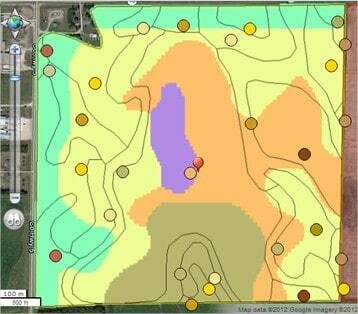 The R7® Tool lets you decide how many zones are represented in a field (from three to 12 zones). Then a map is generated showing where similarities have occurred over time. Once this map is created, it can be exported to Google Earth or any other map-based program that reads .kml/.kmz files and used for sampling purposes. A program like Google Earth allows you to identify each zone in the field and sample site within that zone. While sampling, you can also use the “Notes” section in the R7® Tool to record observations while you are in the field. The image above shows a satellite-derived management zones (SaMZ) map that is automatically created by the R7® Tool using the default maps generated each time a new field is mapped. It uses the tool’s soil variability and yield potential maps to identify areas in the field that have acted the same over time. A SaMZ map of the field can also be overlaid with a USDA soil survey map to see if zones line up, as shown in the example below. Soil sampling can be a daunting process, but using the R7® Tool to create hand-picked zones can take less than five minutes per field. And the same maps you create for zone sampling can be used to create variable-rate fertilizer or seed plans for the next crop year. Talk with your WinField representative to discover how zone soil sampling with the R7® Tool can help you create variable-rate fertilizer or seed plans for your fields in 2016.